Monfumo, unobtrusive location, on top of a hill, with a fantastic view at 365 degrees, sells a single villa located all on one floor with about 5 thousand square meters of garden. Every aspect of the house and every window is a picture of the beautiful hills of Assolani. The view goes both to the hilly areas, to the plain, and to the Mount Grappa. The villa has two large porches where you can stay and eat comfortably outdoors and in the garden. 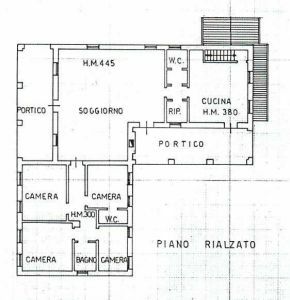 The house is composed of a kitchen, a very large living room with a high roofed roof, very typical of the noble floors, atticed by a fireplace and loft on the loft. The sleeping area consists of 4 bedrooms and two bathrooms. In the basement there is a garage and a large cellar that could become part of the garege. You intend to point out that the addresses in the ads are not identifying the precise location of the property, giving a generic reference only to the client that searches to protect the privacy and confidentiality of the seller. You can view other proposals of residential, agricultural, industrial-commercial and tourist property directly on our site. We also carry out leases, leases, estimates, expert inquiries, and even real estate, energy, commercial, financial, insurance and real estate consulting projects. The ACCORDI agency is a point of reference in the sale through a new way of understanding mediation by focusing on Operated on the customer-to-customer relationship, adhering fully to the principles established by Curia Mercatorum in Treviso for customer protection and adherence to Fiaip (Italian Federation of Real Estate Professionals). The Intention that it serves, the AGREEMENTS that apply.